SAVANNAH – September 2, 2015 – Superstar vocal group, Rascal Flatts will headline the 2015 Rock ‘n’ Roll Savannah Marathon & ½ Marathon on Saturday, November 7, 2015. The band will perform for thousands of runners and spectators at the Toyota Rock ‘n’ Roll Concert Series event powered by iHeartRadio at Forsyth Park. The finish line concert is free and open to the public. Rascal Flatts is known for hit singles, “These Days,” “Bless the Broken Road,” “What Hurts The Most,” “My Wish,” “Take Me There” and “Here Comes Goodbye.” Since emerging on the scene in 2000 Rascal Flatts has earned over 40 trophies from the ACMs, AMAs, CMAs, People’s Choice Awards and more making them the most awarded country group of the past decade. To date, the trio has scored 15 No. one songs, sold over 22.8 million albums, over 29 million digital downloads, and their current ninth studio album REWIND (Big Machine Records) debuted at No. one on the Billboard Country Albums chart, making them one of only four acts during the SoundScan era to have eight consecutive studio albums debut in the top spot. The event will feature two-days of running with the marathon, half marathon and two-person half marathon relay on Saturday and the Rock ‘n’ Roll 5K and One Mile run on Sunday. Participants can take the “Remix Challenge” by running any distance Saturday and any distance on Sunday to earn the coveted Remix Challenge medal in addition to each race’s finisher medals. The marathon, half marathon and two-person half marathon relay will once again start on Bay Street at Bull Street and finish at Forsyth Park. The three distances will travel together before splitting just past mile 11. 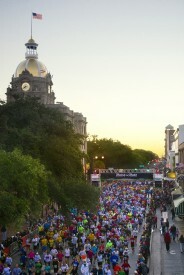 Runners will experience charming town squares, historic buildings and canopies of Spanish moss covered trees. In true Rock ‘n’ Roll fashion, live bands, enthusiastic cheerleaders and spectators will line the race route, concluding with a celebratory finish line festival and post race Toyota Rock ‘n’ Roll Concert Series at Forsyth Park. KiDS ROCK also returns on Sunday and allows children in first through seventh grades the opportunity to race one-mile while Kindergartners run a half a mile. Hundreds of children and their families come out for this race, which will take place in Daffin Park. Rock ‘n’ Roll Savannah Marathon & ½ Marathon returns the weekend of November 5 – 8, 2015 and will celebrate a milestone anniversary of five years of running. Live bands and cheerleaders will entertain participants along the scenic course, which starts on Bay Street at Bull Street and finishes in Forsyth Park. The course travels past charming town squares, historic buildings and under canopies of Spanish moss covered trees. The race concludes with a finish line festival and post-race Toyota Rock ‘n’ Roll Concert Series. Runners who complete Saturday’s marathon, half marathon or relay and Sunday’s 5K or One Mile will earn a special Remix Challenge medal in addition to each race’s finisher medals. A two-day Health & Fitness Expo kicks off race weekend on Thursday, November 5 and Friday, November 6. The free Expo is open to the public and will feature the latest in running apparel and nutrition products. For more information about Rock ‘n’ Roll Savannah, please visit RunRocknRoll.com/Savannah or follow us on Twitter @RunRocknRoll.